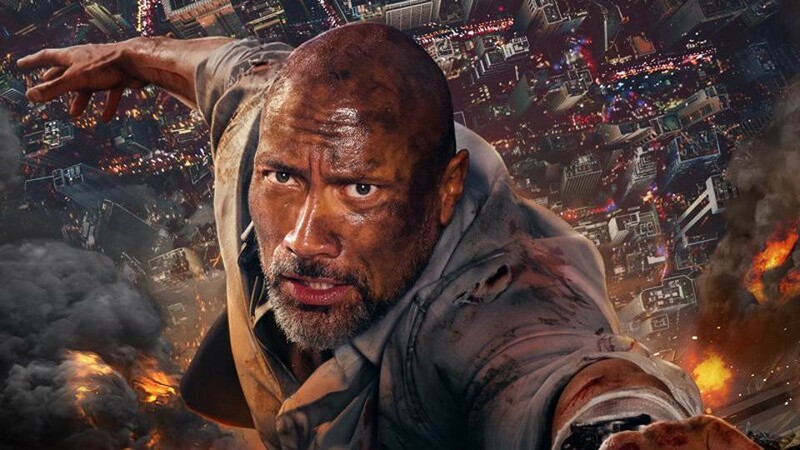 Technically speaking, Skyscraper is the only original big-budget actioner of the summer. But is that really true if it haphazardly knocks off Die Hard, The Towering Inferno and the entire Dwayne Johnson disaster oeuvre? The charismatic actor has one leg in this movie and none to stand on. Trust me. Even air conditioning-seeking moviegoers that pay a ticket for the mindless fun and intentionally cringeworthy dialogue — and know full well that the material is derivative — will exit the theater in a disappointed haze. Johnson retraces his sizeable steps as an anti-everyman named Will Sawyer. It’s not enough that he’s a former hostage negotiator and war veteran. He’s also a world-class high-security expert and devoted family man with a beating heart of pure gold. Will has a wife, played by Neve Campbell, and they have adorable fraternal twin kids. The onscreen coupling isn’t that awkward of a starry mismatch when you consider that Johnson was still an unknown WWE wrestler when Campbell was dishing it week after week as tormented Julia Salinger on Party of Five. She was intelligent about everything except matters of the heart, sigh. Back to Skyscraper. The most bonkers day of Will’s life begins when he gives a green light for a state-of the-art, 240-floor office and residential tower in Hong Kong, dubbed “The Pearl.” The structure might as well be a steel fortress, safe enough to withstand any catastrophe. Then trouble strikes. While Will is monitoring the systems from an offsite location, a shady crime syndicate sets The Pearl ablaze. Will has been framed for it for reasons entirely unclear. Wait, there’s more. Will’s wife and kids, who were supposed to spend the whole day at the zoo to watch the pandas, came back early. Now they’re trapped inside!!!! There will be moments when you will long to instead see those adorable pandas. You already know what Will does next: Use super-human strength to dispatch the bad guys and scale the Pearl to save his brood. And he does it with a prosthetic leg that serves as both a weapon and sliding door place-holder. (The man is nothing if not resourceful.) Too bad the Skyscraper trailer, which has lived online since January’s Super Bowl, gives away the outrageous visual of him dangling upside down in the air. His leg’s mechanism is the only thing saving him from a long plummet to Earth. Skyscraper strives for absurdity. Hi, did you read that last sentence? The problem is that the absurdity isn’t effective. At 92 minutes, the flick is shockingly dull and long. There’s a repetitiveness to Johnson climbing the Pearl — which may explain why he pulls his rescue job long before the end credits. And even those action shots lack suspense. By comparison, think back to when Tom Cruise scaled a nose-bleeder in Mission: Impossible Ghost Nation. Neither of these money-making action stars are in any danger of falling to their deaths. Only Cruise’s dizzying feat kept you glued to the seat. Director Rawson Marshall Thurber, who previously directed Johnson in the equally meh Central Intelligence, gets carried away with his CGI mayhem. How are we supposed to be genuinely delighted or thrilled or care about the plight of the Sawyer family when it’s obvious that this Hong Kong tower and its internal guts were digitally inserted in a Hollywood editing room? The reliance on the green screen zaps all the tension. A man carrying vital information bleeds out from a single bullet in an air-conditioned room; Campbell and her son hurdle down 100 floors in an elevator engulfed in flames, no problem. Johnson’s affability and charm usually radiate off the screen. He’s surprisingly stoic here. Surely he realizes he’s in a popcorn flick, so why doesn’t he shoot off any winking one-liners while he’s creatively drop-kicking all the villains? The accented goons are all bland and indistinguishable anyway; Will might as well note that one of them, say, has feet smaller than that of his sister. All the other one-note characters in Skyscraper run and shriek and sneer their way through a junk plot held together with duct tape. You’ll care about the safety of the kids only because they’re helpless. And nobody, not even Johnson’s safety expert, speaks the bottom line: You can distract with cool technological effects all you want. If you don’t have a solid, structural base, you’ve got nothing.